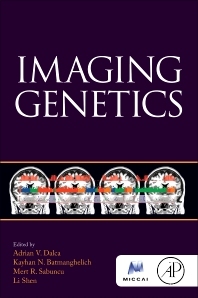 Imaging Genetics presents the latest research in imaging genetics methodology for discovering new associations between imaging and genetic variables, providing an overview of the state-of the-art in the field. Edited and written by leading researchers, this book is a beneficial reference for students and researchers, both new and experienced, in this growing area. The field of imaging genetics studies the relationships between DNA variation and measurements derived from anatomical or functional imaging data, often in the context of a disorder. While traditional genetic analyses rely on classical phenotypes like clinical symptoms, imaging genetics can offer richer insights into underlying, complex biological mechanisms. Adrian V. Dalca is a postdoctoral fellow at Massachusetts General Hospital and Harvard Medical School. He obtained his PhD from the Massachusetts Institute of Technology in the EECS department. He is interested in mathematical models and machine learning for medical image analysis, with a focus on characterizing genetic and clinical effects on imaging phenotypes. He is also interested and active in healthcare entrepreneurship and translation of algorithms to the clinic. Kayhan Batmanghelich is an Assistant Professor of Department of Biomedical Informatics and Intelligent Systems Program at the University of Pittsburgh and an adjunct faculty in the Machine Learning Department at the Carnegie Mellon University. His research is at the intersection of medical vision, machine learning, and bioinformatics. He develops algorithms to analyze and understand medical image along with genetic data and other electrical health records such as the clinical report. He is interested in method development as well as translational clinical problems. Li Shen received a B.S. degree from Xi’an Jiao Tong University, an M.S. degree from Shanghai Jiao Tong University, and a Ph.D. degree from Dartmouth College, all in Computer Science. He is an Associate Professor of Radiology and Imaging Sciences at Indiana University School of Medicine. His research interests include medical image computing, bioinformatics, machine learning, network science, brain imaging genomics, and big data science in biomedicine.